catch up on correspondence using a few of my many tea themed note cards. Yes, I am a fanatic collector of all things tea! in addition to my many purchases. I often wonder how I managed without a computer and smart phone. and young adults in the family wherever they are in the world. and have no access to modern technology. Thus, the reason for the cards and stationary on my desk. will bring a ray of sunshine and warm thoughts of friendship. "Where there's tea, there's hope." Very lovely post, Linda! Sorry you're feeling under the weather today. Hope you feel better soon. 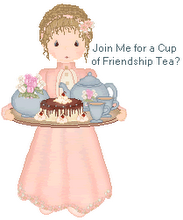 I noticed a box of tea-themed cards by Sandy Clough in your blog photo. I just placed an order with Christian Book Distributors Monday night for five boxes of tea-themed cards. Three are by Sandy Clough, and I think I ordered the box you have. Take care, my friend! Hopefully I can get some inspiration to write some notes of my own! I am sorry you are feeling under the weather. Hope you feel better soon! Yes, even with all our technical gadgets I still enjoy handwritten notes! I too like the personal cards and hand written notes. Tea Themed ones are very nice. So kind of you to take the time and to let someone know you are thinking of them. I hope you are feeling better today. Though I do also love technology, receiving and sending tea notes and cards is oh so special. The recipients of your notes will be thrilled. It will make their day. Hope you are feeling better today. I have a weakness for tea-themed stationery and notecards too! Yesterday, I was at Tuesday Morning and bought the cutest notecards by Punch Studio. They are embossed and have a blue and cream teapot and teacup. Very pretty!